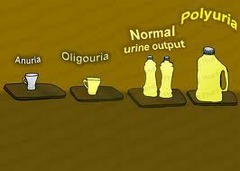 Oliguria is urine flow of less than 0.5 ml/kg/h for six consecutive hours. Pre-renal indicates lack of perfusion of the kidney. Volume depletion, shock, heart failure, fluids in the third space, renal artery compromise. A history of high output gastrointestinal losses (vomiting, diarrhoea), haemorrhage, sepsis, congestive heart failure (CHF) and/or decreased oral intake resulting in hypovolaemia or a combination of these factors associated with hypotension and decreased urine output suggests AKI due to pre-renal disease (or ATN if persistent). When more than 10–15% of the circulating volume is lost, findings on physical examination may include: tachycardia, dry mucous membranes, hypotension, low central venous pressure, oliguria, peripheral hypoperfusion with altered mentation and cold clammy skin with delayed capillary return. Total urinary tract obstruction, such as may result from an enlarged prostate. Severe infection leading to shock. Glomerular disease, acute tubular necrosis, bilateral cortical necrosis, interstitial disease (acute and chronic interstitial nephritis, urate or hypercalcemic nephropathy), transfusion reaction, myoglobulinuria, radiographic contrast media (especially in diabetic, dehydrated, and elderly patients and those with multiple myeloma), ESRD, drugs (aminoglycosides, amphotericin B, vancomycin, NSAIDs, cephalosporins, penicillins, and sulfonamides), malignant hypertension, ischemia, emboli, thrombosis, TTP, HUS, and DIC. blood clots, calculi, and urethritis with spasm. In the anuric patient, one must quickly determine if the kidneys are obstructed or if the vascular supply is interrupted. Treatment of prerenal renal failure is volume replacement; treatment of postrenal failure is relief of the obstruction. The main causes of postrenal failure are obstruction caused by prostatic hypertrophy in men and bilateral ureteral obstruction caused by abdominal or pelvic malignancy in either gender. Uremic pericarditis is an indication for urgent hemodialysis. Other indications include hyperkalemia, metabolic acidosis, severe hyperphosphatemia, and volume overload when refractory to medical management. Treatment of hyperkalemia: (calcium, bicarbonate/beta-agonist, insulin, glucose, Kayexalate). Hyperkalemia is treated initially with calcium to stabilize cardiac membranes; insulin and beta-agonists to redistribute potassium intracellularly (sodium bicarbonate if there is a severe metabolic acidosis); and then loop diuretics, a potassium exchange resin, or hemodialysis to remove excess potassium from the body. Indications for dialysis: AEIOU (acidosis, electrolyte disturbances, ingestions, overload, uremia). A recent history of diarrhea or vomiting should be sought because this is the most common cause in children. Less commonly, fluid loss may result from traumatic hemorrhage or burns or following polyuric states, such as diabetes insipidus and diabetes mellitus. The loss of intravascular fluid volume into the interstitial space accompanies surgery, shock syndromes, and nephrotic syndrome. Children with fluid losses may report thirst, dizziness, palpitations, and fatigue, and a history of weight loss may be present. Does the patient have signs or symptoms of cirrhosis Does the patient have symptoms of a disease, such as lupus, that could cause a glomerulonephritis? Did the patient receive something in the hospital that could cause ATN, such as intravenous contrast or an aminoglycoside? While in the operating room did the patient become hypotensive from sepsis or from hemorrhage that caused ischemic ATN? Is the patient receiving an antibiotic and now has allergic interstitial nephritis? Measurement of urinary electrolytes and calculation of the fractional excretion of sodium (FENa) were devised to differentiate oliguric prerenal failure from oliguric ATN; they are of little use in other circumstances. FENa represents the amount of sodium filtered by the kidneys that is not reabsorbed. The kidneys of a healthy person on a normal diet usually reabsorb more than 99% of the sodium that is filtered, with a corresponding FENa less than 1%. Normally, the excreted sodium represents the dietary intake of sodium, maintaining sodium homeostasis. In prerenal failure, decreased renal perfusion leads to a diminished GFR; if the renal tubular function is intact, FENa remains less than 1%. Furthermore, because the patient has either true volume depletion or "effective" volume depletion, serum aldosterone will stimulate the kidneys to retain sodium, and the urinary sodium will be low (<20 mEq/L). On the other hand, in oliguric ATN, the renal failure is caused by tubular injury. Hence, there is tubular dysfunction with an associated inability to reabsorb sodium, leading to an FENa more than 2% and a urinary sodium exceeding 20 mEq/L. Measurements of FENa and urinary sodium are less helpful in other circumstances. For example, in nonoliguric ATN, the injury usually is less severe, so the kidneys still may maintain sodium reabsorption and be able to produce an FENa less than 1%. Diuretic medications, which interfere with sodium reabsorption, are often used in congestive heart failure or nephrotic syndrome. Although these patients may have prerenal failure, the use of diuretics will increase the urinary sodium and FENa. In acute glomerulonephritis, the kidneys often avidly resorb sodium, leading to very low urinary sodium levels and FENa. Early in the course of postobstructive renal failure caused by ureteral obstruction, the afferent arteriole typically undergoes intense vasoconstriction, with consequent, low urinary sodium levels (Table 78-3). The indications for dialysis in AKI include fluid overload, such as pulmonary edema, metabolic acidosis, hyperkalemia, uremic pericarditis, severe hyperphosphatemia, and uremic symptoms. Because of the risk of fatal cardiac arrhythmias, severe hyperkalemia is considered an emergency, best treated acutely medically and not with dialysis. An urgent electrocardiogram (ECG) should be performed on any patient with suspected hyperkalemia; if the classic peaked or "tented" T waves are present, intravenous calcium should be administered immediately. Although it will not lower the serum potassium level, the calcium will oppose the membrane effects of the high potassium concentration on the heart, allowing time for other methods to lower the potassium level. One of the most effective methods for treating hyperkalemia is administration of intravenous insulin (usually 10 units), along with 50 to 100 mL of 50% glucose solution to prevent hypoglycemia. Insulin drives potassium into cells, lowering levels within 30 minutes. Potassium also can be driven intracellularly with a beta-agonist, such as albuterol, by nebulizer. In the presence of a severe metabolic acidosis, administration of intravenous sodium bicarbonate also promotes intracellular diffusion of potassium, albeit less effectively. All three therapies have only a transient effect on serum potassium levels, because the total body potassium balance is unchanged, and the potassium eventually leaks back out of the cells. Definitive treatment of hyperkalemia, removal of potassium from the body, is accomplished by one of three methods: (1) administration of a loop diuretic such as furosemide to increase urinary flow and excretion of potassium, or, if the patient does not make sufficient urine, (2) administration of sodium polystyrene sulfonate (Kayexalate), a cationic exchange resin that lowers potassium by exchanging sodium for potassium in the colon, or, finally, (3) emergency dialysis.